Wii controls are still being ironed out at this point, but it was mentioned that aiming would likely be controlled by moving around the Wii-mote. 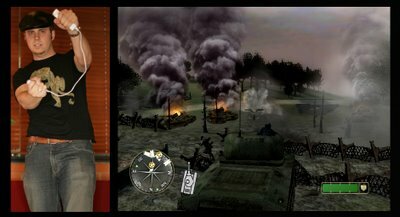 Battle Action sequences will also take advantage of the Wii's unique control aspects, though specifics were not revealed. This is a very bad and horrible trick to those who paid to join just to see something they already saw and to hear something they already knew. We all know that the game will use the Wii remote! How painfully awful this is for anyone who bought into IGN's latest bull. Its not just a fluke that it was Insider only, it was planned and executed well by them because they knew that hungry Wii fans would take the bait. Shame and disgust to them. How do you feel as a Nintendo fan by this? Edit: IGN Wii has now lifted the "Insider" stuff and now you can see the entire article with the screens. A little late though if you ask me. Agree that's not right. That's like thinking you have a real hot date with this girl and you walk up to the door and her boyfriend answers stark naked. Getting us all excited about hearing about how Call of Duty plays on the Wii, to only see Xbox360 impressions. That should not have even been on the Wii page, or there should have been at least a warning but of course there was none. Nice, i used to pay (ign) for the insider scoop but after awhile found out it was the same @#$% thing, as if you didnt have a account with insider.Fooled me but not anymore. Now i just go to gametrailers.com they have more and better video's,sometimes they update more often then ign does. 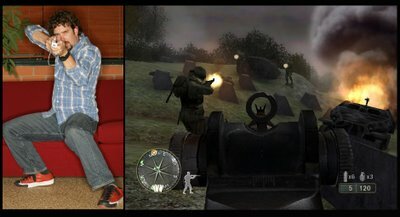 About the game cod3 cant wait love all of them even though sometimes they were all the same. sad about ign,but cant wait till wii&cod3 comes out. Also metaldave i posted a comment on what you said. Great post man. IGN is a rip. They have good videos to watch of certain games but other than that they are a joke. Its unfair to the good people in the IGN Wii forums. They deserve better. Yeah, I clicked on this story and saw you had to pay. I was like, What? Are you serious? Pay just for impressions? I never did. I just figured I would wait until someone else paid and then posted them on the net, which, when I finally saw them, I was glad I didnt pay. What a nasty trick. I'm glad I don't hit IGN much anymore. Now that Rawmeat posts IGN updates on his site, I dont even need to go to IGN at all anymore! "Now that Rawmeat posts IGN updates on his site, I dont even need to go to IGN at all anymore!" Welcome Used Routers, I'm sorry but when I read what you said I laughed right away because its so true. Gonintendo is kinda new but I think its the best site on the net for extremely up to the minute news for Nintendo. Usually the IGN update they post is something that has already been posted on Kevin's site. I remember when he was just a blogger like all of us, he made Gonintendo and the reason why its so successful is because of the straight up news that he posts, no bs just story after story after story. The site caught on by word of mouth and has since become extremely big. He is a really nice guy and treats all that visit his site with respect. A true Nintendo fan. Thanks for the code metaldave. I will post my code tomorrow. Does anyone else care to share their friend codes for Mario Kart? We are all gamers here and Nintendo fans. Thats right sharing is caring. I really hope they improve the visuals because it just looks horrible, even for a Wii game.